abc: thanks for the response -- you're right that it doesn't allow for installation of multiple distributions as some of these tools do and I've modifed the entry. However, I didn't take directly from their website because this program will also work with non-Linux ISOs. from pfc: "UNetbootin allows you to create bootable operating systems to a USB drive without burning a CD." 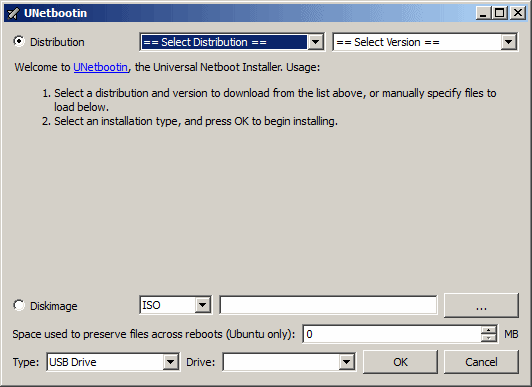 from the website: "UNetbootin allows you to create bootable Live USB drives for Ubuntu, Fedora, and other Linux distributions without burning a CD." The first sentence is unclear if one could install one or two operating systems on a single USB stick, which is untrue if I remember correctly. Ever notice how sometimes a comment thread is like a metaphor? This one explains why Linux hasn't yet taken over the desktop market ... The average user doesn't want to get into a squabble with Eddie Deezen from Wargames. Why not just use the official download link? Download link updated (removed version # from URL). Version changes will lead to wrong links too if links are not updated. That's why it says links should not be dependent on version numbers. If you have problems with that, you should talk to the admin who wrote this rule. Well I do it to avoid those e.g. : wrong link, I dont find it, Where can I download it, etc. A download link should not be dependent on the version number. It says so. D/L link gets me v4.94...exact same version I have from NOV 2010.